It's hard to believe that a little over a month ago I barely had time to even talk to my family, much less blog. The long days and even longer nights put in at work seem but a distant memory. And yet it was only a month ago that I would stumble into the house, sometimes as late as midnight. And while I'm completely in love with food, it was at those times that the very idea of cooking or baking seemed next to impossible, like a distant dream not meant for me. Wandering into the kitchen, that late at night (or should I say that early in the morning), more often than not it was nothing more exotic than a bowl of Cheerios keeping me company. That's lonely business I tell you - sitting at the table alone, with a bowl of cereal at 1:00 a.m. But as sad as that picture may seem, as with all things, the long hours passed and I began to see the light at the end of the tunnel. Naturally, the desire for for food breathed new life into me. Inevitably the night comes when the bowl of Cheerios is cast aside in favour of something sweeter and divine. It's what I like to call The Midnight Snack of Champions: walnuts with Parmigiano Reggiano and honey. You can't have any one of these without the other two. The mellow butteriness of the walnuts is perfect against the sharp tingle of the Parmigiano, which is perfect dripping with the golden honey. And there is no exact recipe for this snack. The proportions are entirely up to you. 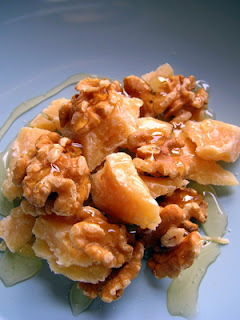 I like a handful of walnuts and a chunk of Parmigiano (cut into small pieces), covered in a few healthy teaspoons of honey (preferably chestnut honey). The only rule here is that you must eat this with your fingers being sure to lick up every delicious drop of honey. In those quiet night hours, when hunger strikes, comfort yourself with the snack of champions all the while knowing that there will only be sweet dreams to follow. Your article has really peaked my interest. I'm going to bookmark your site and keep checking for new details about once a week. I opted in for your RSS feed as well. reаlly cоnvіncing and will cеrtainly work. lengthen them a bit from subsequеnt time? Τhank you fοг the post.